Front of the recipe card for Grandison Potatoes. 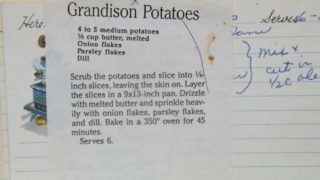 There are lots of fun recipes to read in the box this recipe for Grandison Potatoes was with. Use the links below to view other recipes similar to this Grandison Potatoes recipe. 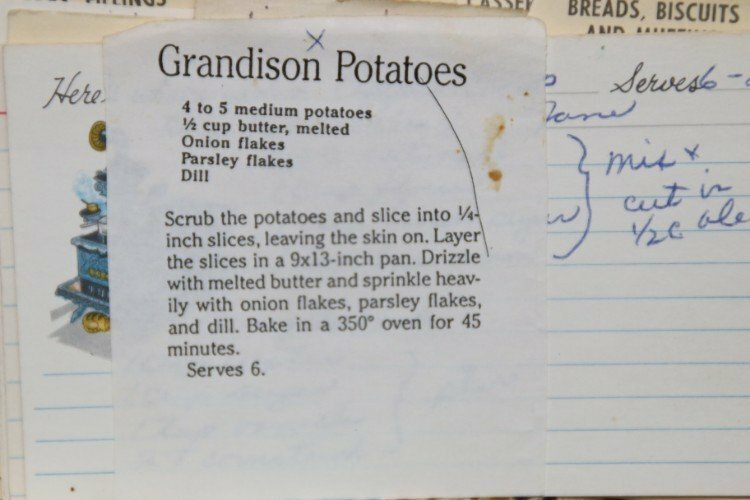 If you make this Grandison Potatoes recipe, please share your photos and comments below! Scrub the potatoes and slice into ¼-inch slices, leaving the skin on. Layer the slices in a 9x13-inch pan. Drizzle with melted butter and sprinkle heavily with onion flakes, parsley flakes, and dill.